GlamCorner wins more customers, increases satisfaction rates, and reduces returns and refunds with reviews. Influence women who have never used a fashion rental service to try GlamCorner – and to earn their repeat business. Count on consumer-generated content in the form of reviews and pictures to provide the information that potential customers need to use GlamCorner’s fashion rental service with confidence. Achieve more conversions and fewer returns and refunds; gain valuable insight into what customers need and want; create a strong sense of community among customers. Order volumes and revenue also grew substantially. How can I be sure the dress I hire is going to look good on me? What if they send me something that doesn’t fit? What if it’s too long? Or too short? 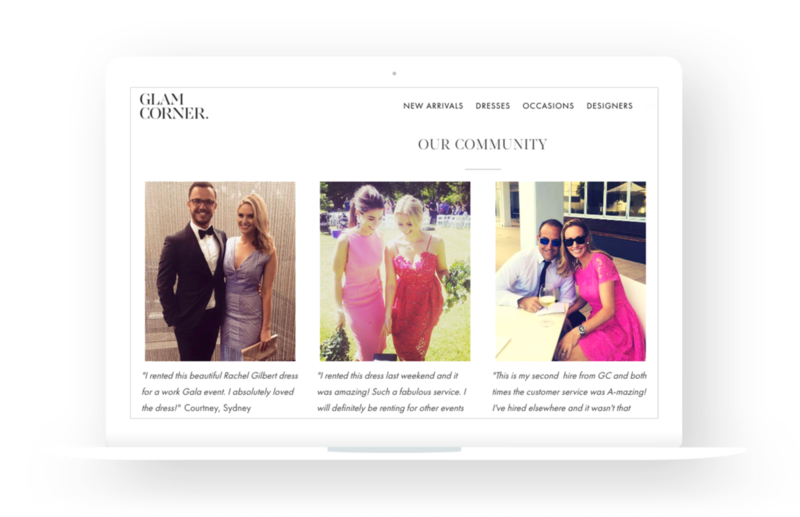 Those are typical questions potential customers have for GlamCorner, an Australian company that’s in the business of renting – instead of selling – designer clothing to women for special events. Fashion rental is a novel concept today, so many women approach it with a dose of skepticism.GlamCorner’s challenge is twofold: overcoming women’s initial doubts and fears about fashion rental so they’ll give it a try, and then delivering a great experience so they’ll keep coming back. The company has been successful in meeting the challenge with help from Bazaarvoice. Customer reviews collected through Bazaarvoice Conversations play a major role in winning women over. Reviews provide the benefit of enabling women to learn from others’ experiences with choosing and wearing rented dresses, making them more likely to make satisfying choices. Consumer-generated content is the single most important driver of our business growth, says Dean Jones, CEO, GlamCorner. “Given fashion rental is still a pretty new concept in the Australian market, we rely on the early adopters to help spread the word about their awesome experience. After just three months of using Bazaarvoice Conversations to collect and post customer reviews, which often include photos and videos, GlamCorner saw conversions increase by 30%. Order volumes and revenue also grew substantially. Jones attributes the increases to women being able to rent designer clothing with confidence because of the guidance and advice other women have shared through product reviews. Introducing Bazaarvoice reviews has enabled our customers to leave a type of ‘sisterly advice’ for the next customer to hire a particular dress, he says, particularly with respect to any nuances relating to size and fit. Nearly half of the reviews include a photo or video to complement the text description, which allows a potential customer to see how a particular dress looks when worn by someone with her exact body type and size. This is critical for any woman considering fashion rental, since styles and sizes can look radically different depending on who’s wearing them. GlamCorner reported a 50% reduction in returns and refunds within seven months of implementing Bazaarvoice Conversations. Fewer returns and refunds mean lower costs for GlamCorner and – more to the point – a better customer experience. As our customers are typically renting a high-end dress for a specific event, size and fit are critical, given there may not be enough time to find an alternative size, says Jones. Addressing this to reduce our refund rates has been a big focus. The value that GlamCorner realizes from Bazaarvoice Conversations goes far beyond increases in conversion, decreases in refund rates, and other metrics. One example: Reviews foster a strong sense of camaraderie and community among customers. We don’t want our customers to simply hire a dress and give it back, says Jones. We want them to feel immersed in the fashion rental concept and get as much out of it as possible. The value of reviews as a source of information about what customers want and need also can’t be overstated.Jones says reviews from customers have provided an additional level of understanding of the broad use cases for GlamCorner’s service – everything from engagement parties and weddings to themed work parties and even military balls. Their “typical” customer has far more diverse wardrobe needs than they initially realized, and that discovery has led to the decision to stock as many different labels and styles as possible to accommodate those needs. The large pool of reviews we’re collecting, sharing, and showcasing on our home page goes beyond crowdsourcing size and fit information – as important as that may be, says Jones. It’s also about providing women the reassurance that others have had delightful experiences with us, and providing us with a powerful way to understand our customers better and to market to them more effectively. Founded in 2012 and based in Sydney, GlamCorner is the leading online destination for women in Australia to rent designer dresses.The company offers a wide range of elegant dresses and stylish accessories for rent at a fraction of the retail price—through delightful experiences on web and mobile. Customer-generated content is the single most important driver of our business growth. Consumer-generated content provides EziBuy with insights, surfaces improvement opportunities and increases engagement.